Hydrodemolition is the sustainable way to protect and preserve concrete constructions. It’s also the fastest and safest technology of choice for emergency repairs. The Spanish contractor, Azul Construcción, knows all this. That’s why they chose Aquajet’s products to perform multiple surgical emergency operations on 6 bridges outside of the Andalusian capital, Seville. 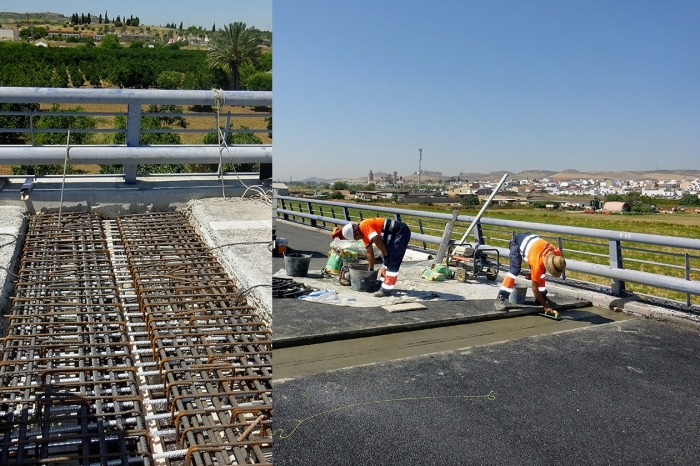 The task, issued by the local government in Andalusia, Minesterio di Fomento, was to refurbish a number of expansion and structural joints in 6 bridges. Today, bridge work is the most common application for hydrodemolition equipment. Hydrodemolition is perfect when it comes to remove large surfaces, without damaging the underlying rebars. Aquajet’s products can also expose highly sensitive bridge joints without damaging post-tensioned cables, and brackets as well as attachments within the joints. 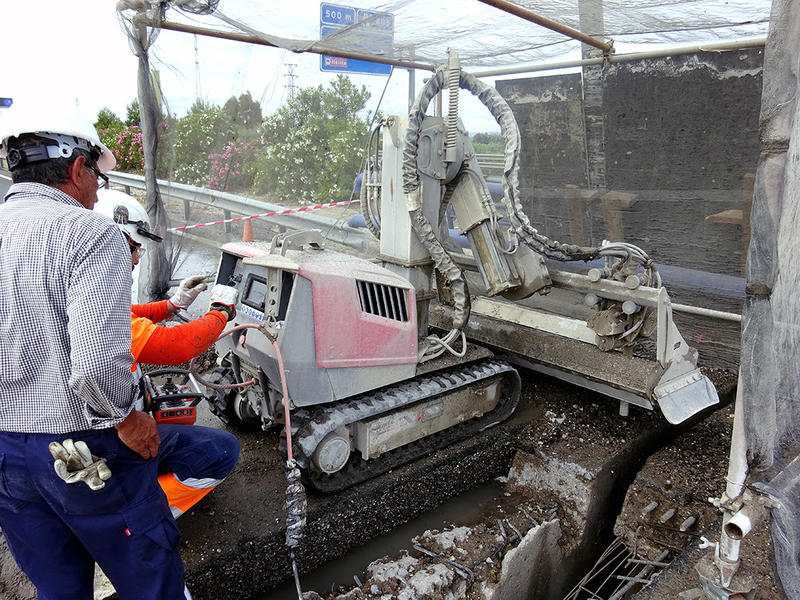 To repair the joints at the Santiponce viaducts on highway A66 and Autovia Ruta de la Plata, Azul Construcción used the AQUA CUTTER 410A – one of the most versatile robots on the market. To make all operations as safe as possible, the bridges were completely closed for traffic in one direction. The cutting depth was set to 30 cm, and the rebars were positioned in two rows, 10 cm and 20 cm down. In total, they removed 625 cubic meters of damaged concrete. The majority of the operations were performed at an air temperature of over 40 degrees Celsius. However, that’s no problem for Aquajet’s robots as they aren’t affected by the weather, like bridges and other sensitive concrete constructions. Thanks to the AQUA CUTTER 410A and Aquajet’s Evolution Control System 2.0, the performance has been optimal, especially around the edges and under the rebars, which in return has minimized manual finishing. Above all, one AQUA CUTTER 410A robot achieved the same objective in one shift, as one traditional hydrodemolition unit had to do in two shifts. In other words, Azul Construcción saved time, water and money by choosing Aquajet. – They are really fast when it comes to demolishing concrete. The Evolution 2.0 control system provides a very accurate control of the tool for removing concrete under rebars. It saves a lot of manpower hours with manual picking after hydrodemolition. The EVO 2.0 is very efficient for cleaning under rebars and on edges of the demolished area, says José Antonio Rodríguez Roldán, Technical Manager at Azul Construcción. The hydrodemolition equipment in Seville were purchased from Aquajet’s dedicated partner, Hammelmann S.L, in Spain. Hammelmann S.L was established on the Spanish market in 1993, as a subsidiary of Hammelmann GmbH. Since 2015 Hammelmann S.L. is an exclusive distributor of AQUAJET SYSTEMS AB in Spain and Portugal with a very good acceptation by our customers in the rehabilitation of structures. They provide a complete solution for the usage of high pressure pumps and pump units, tank and pipe cleaning systems, waterjet cutting, protective equipment and much more. AZUL Construccion is a Spanish contractor specialized in repair and strengthening projects. They often work with applications in confined and tight areas as well as in inhospitable environments. The company has more than 30 years of experience and are highly qualified in Hydrodemolition.